After a record breaking single day debut year in 2015, Northern Invasion has expanded it’s festival line-up to two full days of rock and metal. 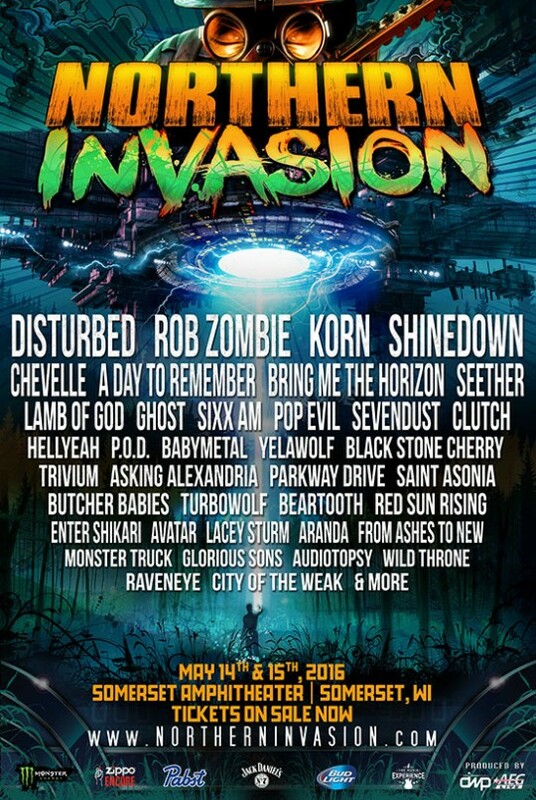 Produced by AEG Live and DWP, Wisconsin’s Northern Invasion joins the likes of Florida’s Fort Rock, Carolina Rebellion, and Ohio’s Rock on the Range to continue raising the bar for the Loudest month in the U.S.
2016’s line up will see the long awaited return of Disturbed, headlining along with rock and metal icons Rob Zombie, Korn, Shinedown, Chevelle, Seether, and Lamb of God. Northern Invasion will also mark the return on former Flyleaf vocalist Lacey Sturm to the U.S. rock festival circuit. Excitement for the festival is also building because of the addition of Saint Asonia, featuring former Three Days Grace vocalist Adam Gontier, Audiotopsy, featuring members of Mudvayne and Skrape, and Japanese vixens Baby Metal. 2015’s Northern Invasion, headlined by Slipknot and featuring Five Finger Death Punch, Volbeat and In This Moment, sold out and brought 12 full hours of continuous music to the normally peaceful hamlet of Somerset, Wisconsin. Expanding the festival to two days will make it the largest of it’s kind in the country, and give it the chance to compete with the likes of England’s Download Festival, Germany’s Rock Am Ring, and Denmark’s Roskilde Festival for the title of the largest rock & metal festival in the world. Don’t wait. Get your tickets now before both days sell out.